FOLIARAPLEX™ is an enzyme-based foliar spray that can help reduce stress in plants. Uptake of FOLIARAPLEX™ is rapid because of its fermentation base combined with organic nitrogen and a superior non-ionic surfactant. 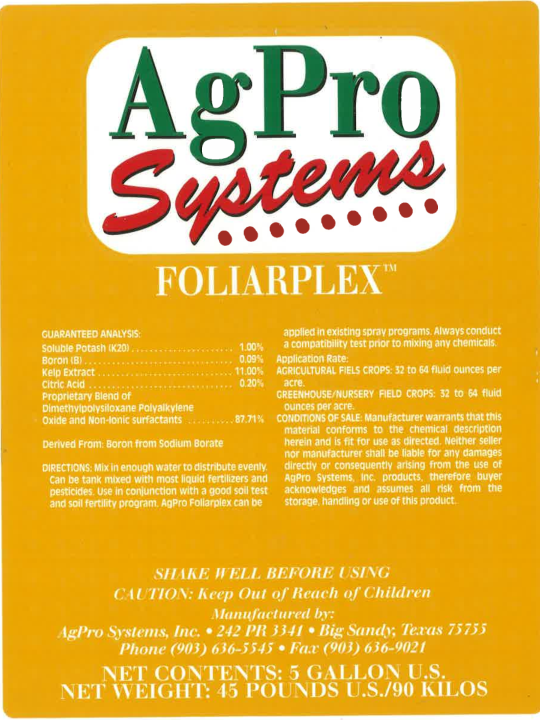 FOLIARAPLEX™ is compatible with herbicides, insecticides, or fungicides. As an additional benefit, FOLIARAPLEX™ enhances the performance of these products through better dispersion and more complete coverage. Its sticker qualities allow for longer retention of the active substance by holding the applied substance to the foliage surface. FOLIARAPLEX™ has shown fungistatic and fungicidal activity and has also demonstrated usefulness as an insect activity exciter, insuring more extensive pest contact with the pesticide. With its special ingredients, FOLIARAPLEX™ not only enhances chemical uptake, but helps protect the crop from chemical damage from the applied chemical. AgPro™ FOLIARAPLEX™ is an all-purpose foliar fertilizer containing a fermentation complex base with organic nitrogen, which improves the uptake and utilization of its micronutrient content. It also contains a superior surfactant which maximizes contact and absorption of the micronutrients. It is a complete “vitamin and mineral” program in a single package. Additional ingredients in FOLIARAPLEX™ make it easy to use with other products being applied to a field. Its non-ionic surfactant is compatible with herbicides, insecticides, or fungicides. The spreader-sticker in FOLIARAPLEX™ enhances the performance of these products by promoting more complete coverage. Its sticker qualities allow for longer endurance of the active substance by holding the substance to the foliage surface. AgPro™FOLIARAPLEX™ also contains fungicidal soaps that work on contact to help enhance the action of fungicides. FOLIARAPLEX™ is especially valuable for use with insecticides. Because it contains various oils to excite insect movement, it induces more extensive pest contact with the insecticide. Also, because of the growth substances present in this product, it enhances chemical uptake, and protects the crop from chemical damage. It should be applied at the rate of 16-32 oz/A when the crop cannot obtain sufficient nitrogen and micronutrients to drive its growth and development; during drought and flooding when absorption through the roots is retarded; during periods of physiological stress such as budding, flowering, fruit set, and fruit enlargement; and at times when temperatures and environmental factors prevent vigorous development. FOLIARAPLEX™ may also be applied to improve resistance to insects and disease. Benefits decline after 3-4 weeks, so mutilple applications during the growing season may enhance higher yields. Shake well and mix in enough water to distribute evenly. Can be tank mixed with most liquid fertilizers and pesticides. Use in conjunction with a good soil test and soil fertility program. Always conduct a compatibility test prior to mixing any chemicals. Agricultural Field Crops: : Foliar applications of 32 to 64 fluid ounces per acre. Greenhouse/Nursery Field Crops: : 32 to 64 fluid ounces per 100 gallon nursery tank per acre. Add FOLIARPLEX™ and mix with normal agitation.